Sorry... the 2017 Volkswagen Golf SportWagen is no longer being sold as new. 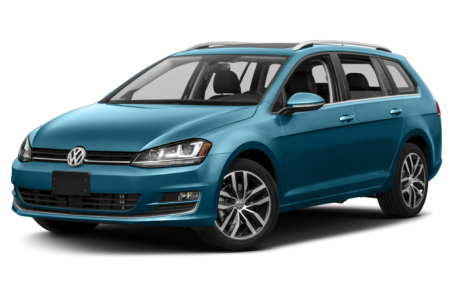 Instead, take the first step to a great deal on 2019 Volkswagen Golf SportWagen with a free price quote! The Volkswagen Golf is available as a two- or four-door hatchback, or as a wagon. Power comes from a gas four-cylinder engine and the five-seat Golf competes with the Mazda3 hatchback, Hyundai Elantra GT and Mini Cooper. Volkswagen's performance-oriented Golf GTI and Golf R are related, as is the e-Golf electric car. A Wolfsburg Edition trim level joins the lineup above the S trim. It features a moonroof, simulated leather upholstery, keyless access with push-button start, heated front seats, rain-sensing windshield wipers, 16-inch aluminum wheels, forward collision warning with automatic emergency braking, a blind spot warning system with rear cross-traffic alert, and Wolfsburg Edition badges and floormats. Meanwhile, the S trim level of the Golf SportWagen is now available with all-wheel drive. All-wheel-drive models can have a manual or automatic transmission.